Daniel Kaufmann is a circular economy and sharing economy expert. 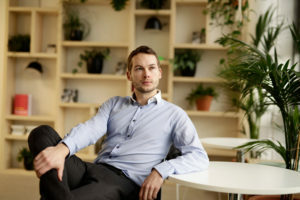 Daniel has a master’s degree in Creative Sustainability from Aalto University. Daniel believes that in 2030, it will already be a bit embarrassing to own things. Daniel works with different-sized companies and challenges the society to make systemic change – how can we decouple well-being and economic growth from natural resource use and increased emissions? At Sitra Daniel is especially responsible for the circular economy projects Sitra does with companies and the private sector. Daniel designs, finances, steers and engages in different kinds of projects. Daniel has several years of experience in management consulting, focusing on business development and finding competitive edge from sustainability. He has also been involved in founding start-up companies in Finland and Colombia, worked in research & development and studied in Argentina and Costa Rica. In his projects Daniel has studied circular economy business models, defined corporate strategies and new operating models, used service design to create new ways of operating in the public sector, sparred start-ups and lectured on competitive advantage or carbon handprint. Daniel also was a key player in the team that facilitated the birth of the Finnish roadmap to circular economy 2016-2025. Could his next initiative be a documentary project on the circular economy of cars in Africa?